I wish I had a photo of me clearing the snow or spending time with family... but I shoveled when I got home and waking up at 1AM for 7 straight days wore me out. I went down for a nap at 2PM when the kids did the same and I slept right until this morning. So I missed the AFC/NFC championship games and more importantly: the total lunar eclipse. I was heartbroken. The final stages of the partial eclipse were still happening, so I did take up Summer to show her. She wanted a telescope for Christmas, so I wanted to fuel her desire to appreciate science. Anyway... I am back in the saddle again today and I THINK I will have Friday off later this week. Above are the snowfall totals from the weekend event. 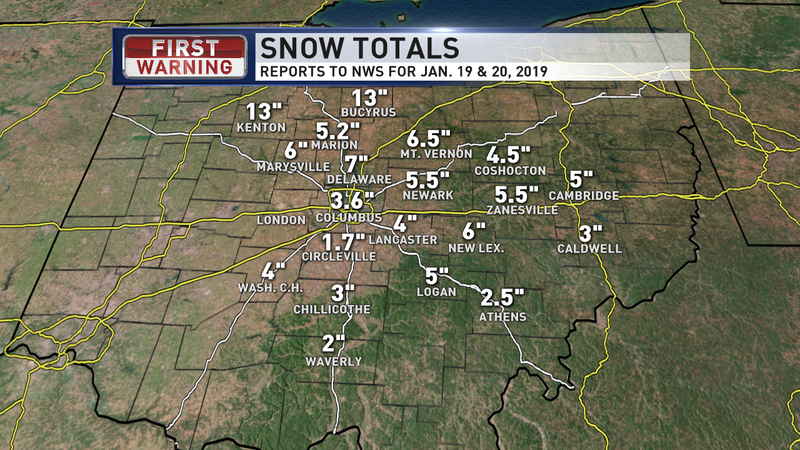 As expected, Northern Ohio saw the majority of the snow and Central/Southern Ohio eventually switched over to accumulating snow after the rain/ice. 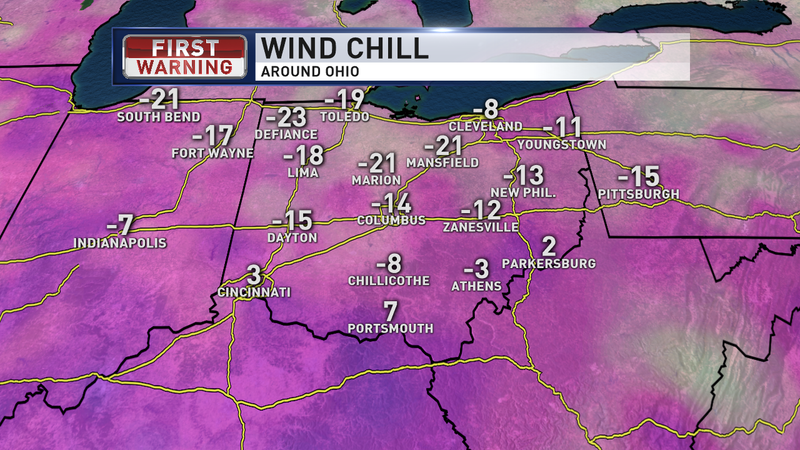 The clear skies and fresh blanket of snow has allowed the temps to plummet. 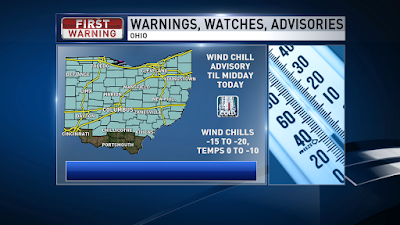 Winds are 5-10 mph, but cold enough for some dangerous wind chills and frostbite could occur in 30 minutes or less. There is a Wind Chill Advisory through midday today. 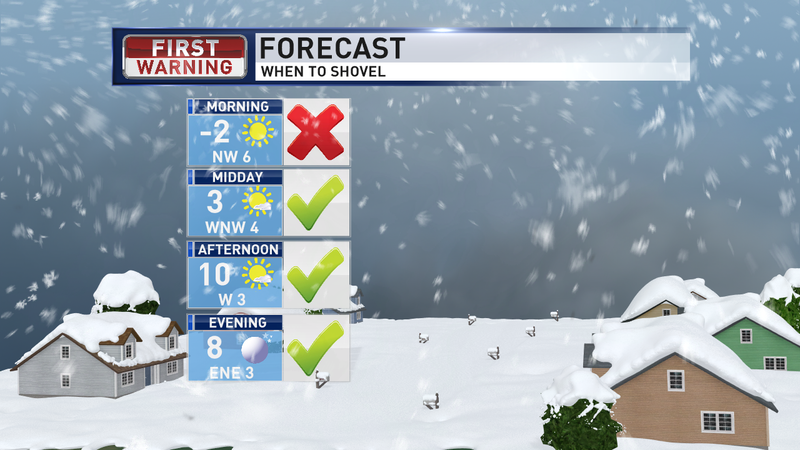 If you did not shovel yet, I would hold off until later in the day again. Not because of the snow blowing around, but because of how cold it is. 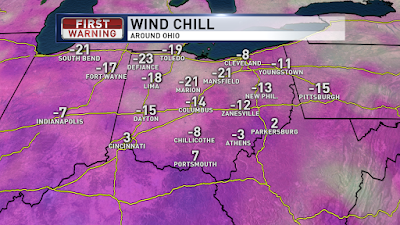 So today: frigid and sunny. 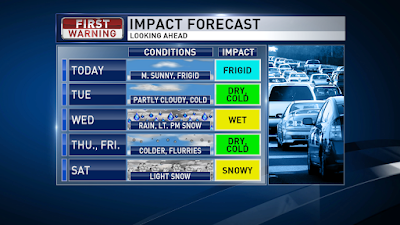 We have a few other weather events that could impact your week ahead. 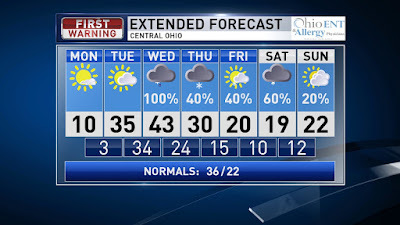 Partly cloudy and increasing clouds later Tuesday with a high of 35. Rain moves in late Tuesday evening, but the daylight hours should stay dry. When the rain initially moves in Tuesday PM, there is a slight chance the leading edge could start as some freezing rain before we warm up more. Rain showers Wednesday with a high of 43, but falling temps later in the day will change the rain over to some brief snow showers later Wednesday. A few flurries and light snow showers are possible Thursday and Friday, but it doesn't appear to be much in the way of accumulation for Central Ohio for the end of the workweek. All models agreeing on another winter system next Saturday. With a high of 19 this will stay all snow... no rain. Right now accumulations look light, but we will keep an eye on it through the week. So stay tuned through the week and have a good one!